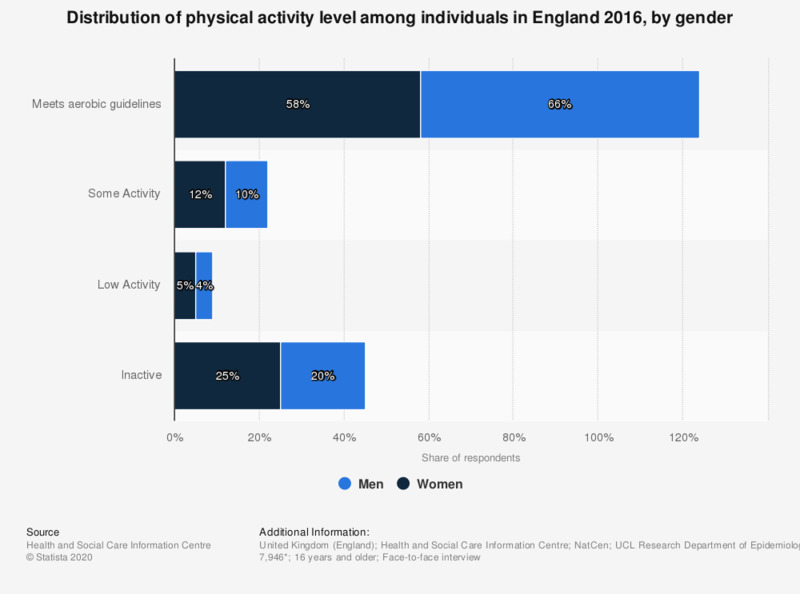 This statistic displays the results of a survey on the physical activity levels of men and women in England in 2016. In that year, 66 percent of male respondents met the aerobic guidelines in England. * Weighted bases: n (men) = 3,898; n (women) = 4,048. - For non-occupational activity, this is limited to bouts of at least 10 minutes. - Meets aerobic guidelines: At least 150 minutes moderately intensive activity (MPA) or 75 minutes vigorous activity (VPA) per week (pw) or an equivalent combination of these. Some activity: 60 to 149 minutes MPA pw or 30 to 74 minutes VPA pw or an equivalent combination of these. Low activity: 30 to 59 minutes MPA pw or 15 to 29 minutes VPA pw or an equivalent combination of these. Inactive: Less than 30 minutes MPA pw or less than 15 minutes VPA pw or an equivalent combination of these.